After years of planning, a Yorkshire based self-builder has created a stunning new home with the help of Leeds-based HWL Windows Group. Completely renovating his own home has been a life-long dream for Robert Brown and, on finding the perfect property, he was finally able to take steps to turn that dream into a reality in 2011. Located in a small Yorkshire town, the detached house was well built, but stripped back to its shell, it left Mr Brown with a blank canvas to work with. Acting as his own project manager, Robert Brown took the opportunity to design both the exterior and interior of his new home by drawing on a series of ideas that he’d built up after travelling across Australia and the United States. 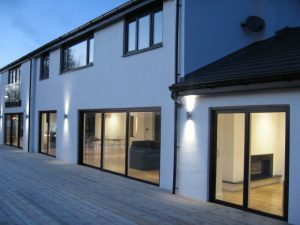 With such a keen eye for design, the aesthetics of the property were paramount and Mr Brown had a vision of a very contemporary property with high gloss white interiors, white rendered exterior walls and black windows and doors. Energy efficiency was also an important factor, not just for keeping the heating costs down, but for satisfying the planners’ requirements as he needed to ensure the u-values met new building regulations. With a u-value of just 0.8w/m²K, HWL’s Kommerling PVC-u windows were the perfect option, especially as they could be fabricated in black on the outside and white on the inside to complement both the interior and exterior of the build. Tilt-and-turn windows were specified throughout the property as they offer improved ventilation and ease of cleaning, whilst being very secure. The house overlooks a river and in order to take advantage of the views from the first floor, a small Juliette balcony was fitted off the main bedroom along with inward opening Kommerling French doors, manufactured by HWL Windows Group. To the ground floor, Robert Brown wanted to take full advantage of the views and he specified four sets of large sliding doors. HWL recommended aluminium frames because they are specially designed to carry the weight of large the glass panes required. A thermally efficient, stylish black Solidor composite door to the front completed the stunning look of the property. HWL Windows Group has 15 years’ experience in supplying self build customers with the very highest quality windows and doors. As a manufacturer of Distinction, Solidor, Residence 9, Spectus, ALUK, and Kommerling, HWL manufactures bespoke windows, doors, patio and bi-folding doors in any size required. By carrying out a double survey, once at the initial quotation stage and again during the manufacture stage, HWL ensures that the installation process runs as smoothly as possible. This is essential for self-build projects. Based in Armley, Leeds, HWL produces hundreds of windows and doors for installation across Yorkshire and the UK. The company prides itself on delivering an unbeatable level of customer service, combined with a range of market leading products and industry-leading guarantees. For more information on self build service from HWL Windows Group, visit the website http://www.hwlwindows.co.uk/ or call 0113 244 9006.